Shawinigan, QC – When you’re not used to losing, the cold, hard reality of it can make for a difficult adjustment. 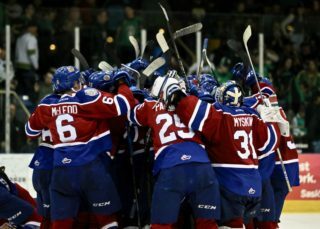 Following a season in which the Oil Kings strung together 22 straight wins and rolled over (most of) their opponents en route to a WHL Championship, it’s been a different ride at the 2012 MasterCard Memorial Cup. 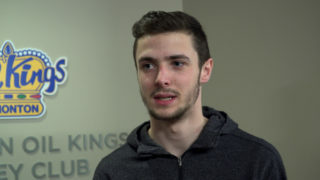 “We’re a little frustrated that we’re not showing the entire CHL the true side of the Edmonton Oil Kings,” said defenceman Keegan Lowe, whose heart-on-his-sleeve emotion should come in handy Thursday vs. Shawinigan in a win-or-go-home tiebreaker. The Oil Kings haven’t lost three straight all season and now need a similar streak on the winning side to capture the national title. 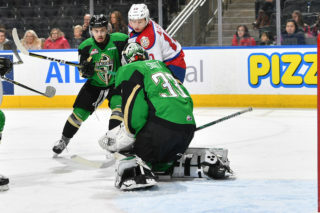 Just 11 days ago, a centre-ice celebration at Rexall Place marked the club’s season-long success, but the tides have quickly turned as the Oil Kings look to avoid an early exit in Quebec. “I wouldn’t say there’s a hangover or anything, but we haven’t been at our best,” Lowe said. “We’re making little mistakes, like turnovers at the blueline and then having the other team come back and score. We’ve got to pay more attention to things like that or it’ll hurt us even worse. 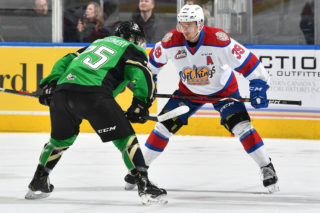 While the Oil Kings had stars such as Michael St. Croix, Tyler Maxwell and others shoulder the load throughout the regular season, it was the team’s depth that truly countered opponents that relied heavily on individual performers in the playoffs. The Portland Winterhawks were an excellent example of that. Ty Rattie, Marcel Noebels and Sven Bartschi, especially, were sensational. But when they weren’t going, the Winterhawks had little to answer with. 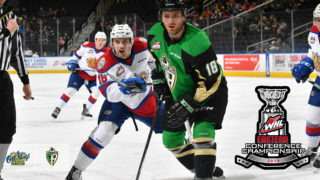 In the Oil Kings’ case, when the missiles aren’t clicking in unison and it’s compounded by an individual’s struggle to step up like he has, the Western Hockey League’s best and most balanced team can appear ordinary. And ‘ordinary’ doesn’t author an appropriate epilogue. “We’re a team that has a lot of depth, a strong defensive core and an unbelievable goaltender,” Lowe said. “All year long we’ve been thriving on our depth, wearing teams down. We might not get the win until late in the game, but that’s where depth pays off, because everybody still has some energy while other teams are shortening the bench. 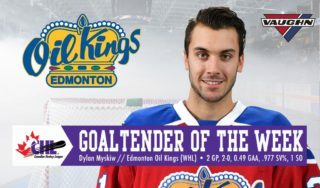 The Oil Kings don’t need to re-write an entire identity, either. It’s simply about reestablishing it — the one that made them champions in the first place.